Edgar Westbury was often criticised for his lack of attention to big two stroke motors, yet the Atom series all did service in hydroplanes from the 1930s onward. 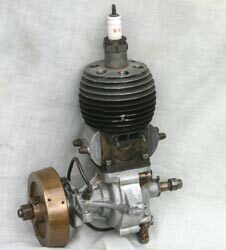 The cylinder porting arrangement with the separate transfer covers was very basic, yet the induction system and oil pump in the crankcase was relatively advanced. The cast iron cylinder was a big heavy lump and many home constructors opted for an aluminium casting with a liner. Harold Puntis went one stage further and redesigned the cylinder configuration for a single exhaust port. 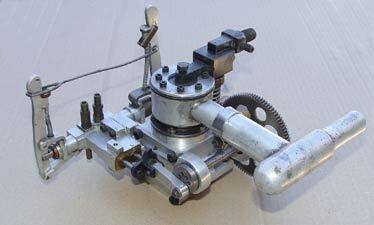 The original Westbury design employed a ratchet and pawl system within the flywheel for a separate cord ring for starting. 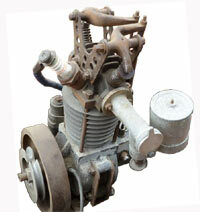 There is no doubt that the crankcase is one of W.J. Smith's Belvedere motors from around 1909. The head and cylinder are a little more of a mystery as the head is bolted to the barrel through the flanges, rather than two lugs cast into the water jacket seen on similar engines. 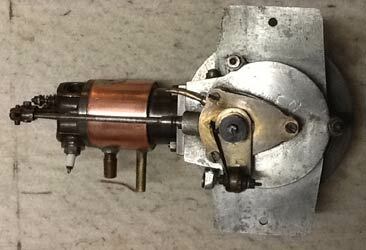 The copper water jacket is shrunk or pressed onto the cylinder which is similar to the aircooled motors Smith advertised, as is the head. The cooling water inlet has been moved at some stage, but otherwise this is a superb example of one of the very earliest IC model boat engines. The bottom half of this motor is a standard Simplex from Bond's. 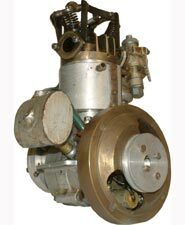 It was a backward step when the Bonzone with its sophisticated cylinder head was dropped for the Simplex with a very basic, parallel valve version. 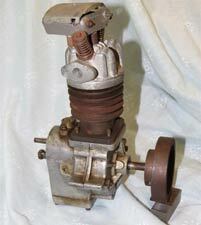 This inclined valve head would have improved performance no end, allowing higher compression ratios and much better combustion with a hemi-spherical combustion chamber. The head is not from Bonds, so as yet we have no idea of its origins, but suspect that it may have been built by the owner of the boat featured this month. From photos it would appear to be a later venture than the building of the boats. This was the first of Ian Berne's A Class motors, built around 1987 for the original 'Steam Machine'. It was very much modelled along the lines of Bob Kirtley's design including having manual fuel and water pumps. 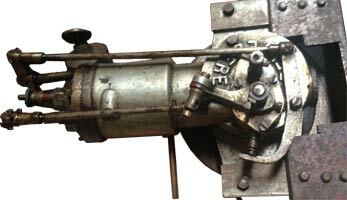 The hand pump for the fuel was dropped in favour of operating the mechanical pump ram by hand via a latch that could be disengaged from the drive. Clear to see are the large reduction gear and variety of holes in the pump drive disc to give different pump strokes. From the word 'Belvedere' cast into the crankcase cover it can only be assumed that this is one of W.J 'Belvedere' Smith's original motors from the first decade of the 20th century. It has the same cambox layout as other engines of his but someone has very cunningly changed the atmospheric inlet valve to cam operation by using a second follower on the single cam at a different position and working through the long J shaped rocker. This is the only motor we know of with the cast-in name and is a truly remarkable find having been salvaged from a scrapyard. Or is it? several theories have been bandied about as to what it might have been originally, but with its twin eccentric driven pumps it does seem as if it has seen service as a steamer. 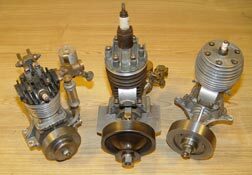 What is fascinating are the piston valves on top of the power pistons, which admit steam to different cylinders. 3-1, 2-3, 1-2. Exhaust is by uniflow ports at the lower end of the cylinders. Both the owner and ourselves would welcome any further thoughts on this motor and inlet arrangement, which if not unique, must be extremely rare. Missing from this group is half of a Kittiwake that also came from the boxes of bits sold at Gildings. Apart from the Kiwi on the left all the other engines were in bits and even after assembling them all, there are still some spare parts that have no obvious home. The Atom III in the centre has the feel and patina of an original motor and is a magnificent 'lump', whilst the Atom V was obviously a more recent build. The two Atoms are destined for hydro restoration projects. The flywheel and notched pulley would indicate that this early MKI saw service in a boat at some stage. A serial number of 108 puts it at the very earliest days of production as it is believed the series started at 100. This joins 106 as the lowest numbers discovered so far. 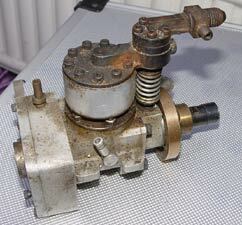 The Rowell motor is still a rare item with only around 10 that have come to light in the last few years. For further details of this and other Rowell items go to our Rowell history page and Rowell gallery page. As a guide it sold on ebay for £340. 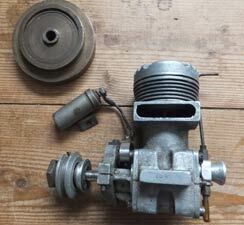 This motor is probably contemporary in age with the Stuart featured last month. The inlet over exhaust layout is very early, again with a lightly sprung atmospheric induction valve and a cam operated exhaust valve. From the size of the plug we would guess at around 8cc. 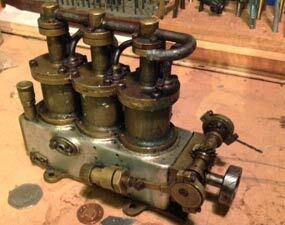 The crankcase casting is an intriguing shape and possibly indicates a commercial origin. 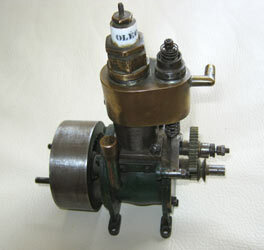 A brass 18mm OLEO plug, which is of French origin, might date this engine more accurately as well as indicate that it may have been made in France. Engines of this vintage and configuration are very rare and the owner would welcome a positive identification as would we. Of the plug there is plenty recorded, but of the motor, nothing so far.